Beyond the Curriculum, the weekly forum put together by the University of Ghana Business School Mentoring and Students' Services Unit continued on Friday, 6th April, 2018, at the R.S. Amegashie Auditorium. 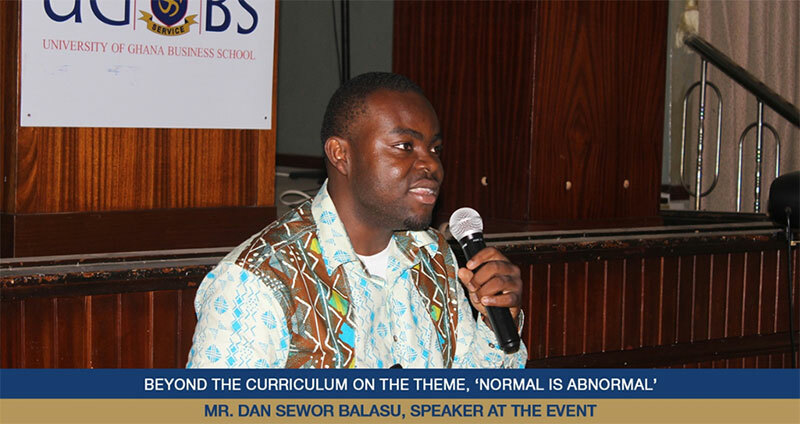 It was an entrepreneurship session themed 'Normal is Abnormal' and was handled by Mr. Dan Sewor Balasu, an alumnus of UGBS, who is an entrepreneur. Mr. Balasu explained that entrepreneurship is a venture for risk takers and urged all who want to be entrepreneurs to be risk loving. He asked them to explore all windows of opportunities and identify business ideas in every situation. 'Just because it is not normal to you does not make it wrong, and the moment everything becomes normal, Innovation stops - thus people stop thinking outside the box, society loses competitive advantage and everything becomes casual', he asserted. The need to step out of one's comfort zone was also emphasised. According to the speaker, not only are ideas not generated, but also the spirit of entrepreneurship is nipped in the bud anytime people are in their comfort zones. He concluded his presentation by explaining that it is due to other people's entrepreneurial adventures that services such as Uber, Shopaholicks, Koko King, Atomic Waakye and even social media platforms such as Whatsapp and Twitter exist. He said since these services have made life easier, the younger generation must make it a point to also come up with more innovative ideas for continuity of society. There was a question and answer segment where students' concerns were addressed.